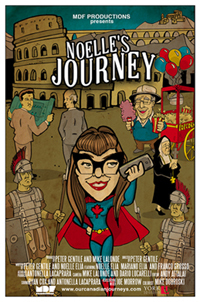 Noelle's Journey a documentary film by award winning director Peter Gentile, MDF Productions, produced in conjunction with The Mariano A. Elia Chair in Italian-Canadian Studies, York University was premiered at a gala opening on 10 June 2017 at the Italian Contemporary Film Festival. The screening at the TIFF Bell Lightbox was the opening event of the Italian-Canadian Film Festival of the ICFF titled "From Bello to Beautiful: The Art and Impact of Italian-Canadian Film." The film follows Noelle Elia on her voyage to discover the worlds of her grandfather, Mariano Elia, and that of her good friend, Franco Grosso. Click here to access the interactive timeline tracing the life of Noelle's grandfather, Dr Mariano A. Elia. The following obituary is reprinted in memory of Dr. Mariano A. Elia, whose donation made possible The Mariano A. Elia Chair in Italian-Canadian Studies at York University. The obituary was written by Noelle Elia, a grand-daughter of Dr Elia, and was published originally in the Globe and Mail on Saturday 4 February 2006. The Mariano A. Elia Chair © 2017 York University. All rights reserved.